Clothing/Jewelry Description A black windbreaker jacket, a red tank top, blue nylon shorts and black Nike sneakers with red laces. Distinguishing Characteristics Caucasian male. Brown hair, green eyes. Jeremy has a mole on his chin. He has scars on his forehead and nose. His feet are exceptionally large for his height; his shoe size is 13. Jeremy's left index finger was broken at the time of his disappearance. Jeremy attended the Coos County Fair in Oregon with his nine-year-old sister and a group of his friends on August 14, 1986. He and his sister separated at 2:00 p.m., agreeing to meet up again near the ferris wheel at 5:00. He never showed up at their meeting place and has never been seen again. 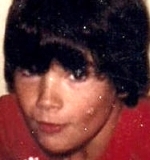 Jeremy lived in Grants Pass, Oregon in 1986, but he had grown up in Myrtle Point and had many relatives living there. He and his younger sister enjoyed the fair and their stepfather agreed to take them there for the week so they could go to the festivities. He left his keys and wallet behind at his stepfather's home, as well as a watch he'd bought recently. He spoke to his mother on a pay phone on the day of his disappearance, and she stated their conversation was normal. There were several possible sightings of Jeremy in the local area in the days following his disappearance, but none of them were confirmed. He was a basketball player in 1986, and was looking forward to starting high school. Many rumors circulated about his disappearance: that he was accidentally shot during target practice or while swimming in the Coquille River, or that he died of a drug overdose at a party and his friends disposed of his body to avoid possible legal consequences. None of these stories have been substantiated, but the Coos County Sheriff believes he died the day he was last seen. Authorities do not believe Jeremy left of his own accord. He was close to his sister and it would have been uncharacteristic of him to abandon her, and he did not take his wallet or extra clothes when he went missing. His mother and stepfather were going through a divorce in 1986 and he may have been somewhat troubled as a result; his grades dropped during the school year prior to his disappearance. However, he was described as a popular, likeable teenager and a star basketball player who was looking forward to the start of the school year. Terry Lee Steinhoff is considered a person of interest in Jeremy's disappearance; he is Jeremy's former babysitter, and several witnesses reported seeing Jeremy sitting with him in a truck that night. A photo of Steinhoff is posted with this case summary. He wasn't cooperative with the investigation into Jeremy's disappearance, and in January 1988, he stabbed a woman to death. He pleaded guilty to murder and was sentenced to life in prison. Steinhoff died in prison in 2007. Due to the lack of evidence in Jeremy's case, it is classified as a non-family abduction and a potential homicide. His family believes he's deceased and they held a memorial service for him in August 2011, on the twenty-fifth anniversary of his disappearance. Jeremy's mother thinks his body is somewhere in Coos County. His case is unsolved. Updated 9 times since October 12, 2004. Last updated November 3, 2018; picture added.